The U.S. average retail price of diesel dropped 3.5 cents to $3.282 a gallon in data reported Nov. 19 as crude oil prices fell amid persistent concerns about oversupply. It marked the fifth consecutive weekly decline in the price of trucking’s main fuel. The price has fallen 11.2 cents during that period. Still, diesel costs 37 cents a gallon more than it did a year ago, when the price was $2.912, the Department of Energy reported. Average prices fell in all regions of the country, led by the Midwest at 4.6 cents per gallon. The national average price for regular gasoline dropped 7.5 cents to $2.611 a gallon, DOE’s Energy Information Administration said. The average is 4.3 cents higher than it was a year ago. Average gasoline prices fell in all regions. WEEKLY FUEL PRICES: See table with national, regional averages. One diversified trucking company reported it recently added new trucks as a means of lowering its operational and maintenance costs. “During the quarter, we took delivery of a large majority of the remaining new ABF Freight replacement road tractors that were ordered for this year,” ArcBest Chairwoman and CEO Judy McReynolds said during a third-quarter earnings call. Other companies are taking similar steps. Class 8 sales in October reached the highest point in more than three years as a smoother supply chain and the bullish economy lifted the total to 25,007, WardsAuto.com reported. ArcBest’s plans call for replacing 600 trucks in 2018. ABF Freight is the parent company’s less-than-truckload arm. The Fort Smith, Ark.-based carrier operated about 4,400 Class 8 tractors in 2017, according to the latest data. “These new tractors contributed to better average fuel economy during the quarter and a reduction in repair and maintenance costs,” McReynolds said. The new tractors also came with collision mitigation systems, lane departure alerts and forward-looking cameras in the cab and the truck. Since 1994, all new ABF Freight trucks include computerized engine shut-offs to automatically reduce idling, which further reduces fuel consumption and limits emissions, according to the company. ABF Freight received a 2018 SmartWay Freight Carrier Excellence Award from the Environmental Protection Agency. Since 2004, companies participating in the SmartWay program have avoided emitting more than 103 million metric tons of air pollution while saving more than 215 million barrels of oil and $29.7 billion in fuel costs, according to EPA. At the same time, diesel fuel often is purchased on the road at a discount through price-saving agreements. 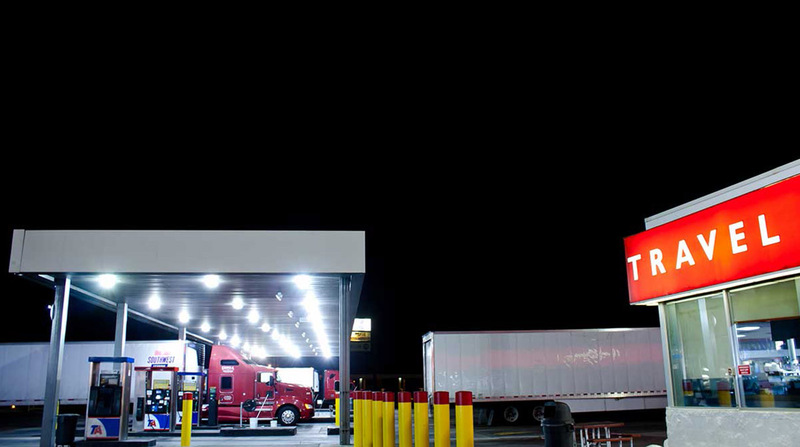 Publicly traded TravelCenters of America — which operated 259 travel centers in 43 states at the end of its third quarter Sept. 30 — reported 83% of its diesel fuel volume in the quarter was sold at discounts to posted prices under pricing arrangements with its customers, some of which include rebates payable to the customer after the end of the period. In the meantime, no part of the United States is favored to have below-average temperatures this winter, according to the National Oceanic and Atmospheric Administration’s latest seasonal outlook. 2018 began with bitter cold across much of the country that boosted demand for distillate fuel — which includes home heating oil and ultra-low-sulfur diesel — and sent pump prices for diesel higher. To prepare for winter, experts advise fleets to change fuel filters early in the season to reduce the chances of clogging due to ice or wax. Also, keep tanks full overnight when there are significant swings in temperature and drain fuel-water separators frequently to reduce the chances of ice forming. West Texas Intermediate crude futures on the New York Mercantile Exchange closed at $56.76 per barrel Nov. 19 compared with $59.93 on Nov. 12. The Nymex mostly is an electronic platform exchange, on which buyers and sellers can trade various fuel commodities, on paper, any time from a month from now to 18 months in the future, according to the Oil Price Information Service. Russian Energy Minister Alexander Novak, meanwhile, said producers need to “better understand” the current conditions and the winter outlook before agreeing to slash supplies, Bloomberg News reported.